There are many ways to add images and color to clothing but one of the most striking and aesthetically pleasing is digitally reproduced embroidery. 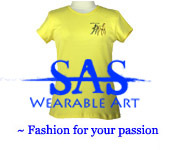 Not to be confused with a corporate logo or label our unique and stylish embroidered clothing is actually wearable art that features images taken direct from water color and acrylic paintings that are then digitally reproduced and carefully embroidered onto your choice of sports shirt, tee shirt, sweatshirt, fleece pullover, fleece outerwear or tote bag. Most people assume embroidered images on pieces of clothing are the label of a famous designer or the logo for a huge corporate conglomerate. As if these people need any more advertising. But when you look closely at our fine collection of polo sports shirts, all cotton tee shirts and canvas tote bags you’ll notice that the images we embroider onto the garments are actually digitally enhanced reproductions from some of our personal favorite water color and acrylic paintings featuring equine themes and line art. Two of our best-loved works of art are the Colts Playing and the Four Horses. Capturing the life, personality, character and majesty of horses these original works of art are now available as wearable art in the form of embroidered tee shirts, sweatshirts, fleece pullovers and fleece outerwear. Featuring 100% natural cotton and painstakingly selected colored threads each garment becomes a treasured piece of wearable art that is unique, comfortable and colorful. The process of embroidery allows the original artist to hand-select the colored threads so the reproduction is as accurate to the authentic painting as possible. The threads feature slightly altered tones that allow for detailed shading, color depth and stroke width that capture all the subtle nuances of the original water color or acrylic painting. The combination of original art and digitally enhanced reproduction technology allows for a superior embroidered stitch that captures the essence of the original painting the way no other reproduction method can. Our embroidered images bring to life the initial subject matter and take it from the canvas in precise detail and reproduce it to your choice of clothing garment.